providing long-term pain relief in interventional pain management settings. Cryoanalgesia is based on temporary disruption of sensory functions of some parts of the nervous system using extreme cold. Cryoablation is gaining acceptance as an innovative method in pain relief. Cryoablation does not damage nerve structures permanently which is why nerve tissues can regenerate slowly with no risk of post-procedural neuritis. The method is safe and minimally invasive, recommended especially when conservative means have proved ineffective. Mode selection and probe cleaning/freezing can be performed automatically using the footswitch or touch screen which allows to keep the site of a procedure under sterile conditions. 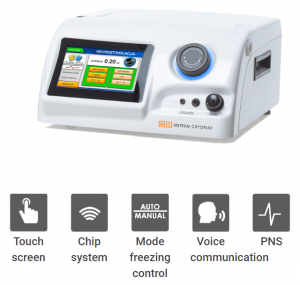 Electronic communication (chip system) between the connected probe and device allows recognition of optimal operating parameters and auto-configures the cryoprobe characteristics. Pressure and gas flow are set automatically and requires no manual adjustment. Cryoprobe temperature, cylinder pressure, gas flow inside of cryoprobe and procedure time are displayed during freezing. The largest selection of Cryoprobes – The thinnest cryoprobes for cryoanalgesia available on the global pain management market. Available as Single-Use and Reusable. Reusable probes are available Straight and Angled.